Major Andrew David Byers was born on September 2nd, 1986. 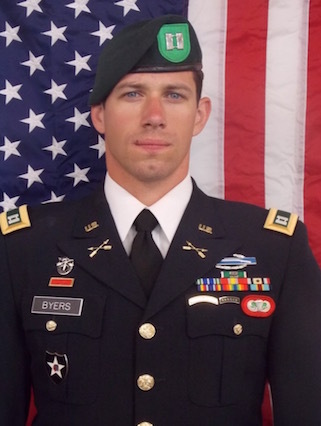 Byers, who was selected as a General Wayne Downing scholar, had an incredibly bright future as a leader in the Special Forces Regiment. Maj. Byers graduated from the United States Military Academy at West Point in 2008 with a Bachelor’s Degree in History. After commissioning as an Infantry officer, he served with the 1st Battalion, 38th Infantry Regiment, 2nd Infantry Division where he completed a combat rotation to Iraq as a Rifle Platoon Leader. Maj. Byers joined the 2nd Battalion, 10th Special Forces Group (Airborne) Family in the summer of 2014 and served as the Executive Officer for Bravo Company, 2nd Battalion, 10th SFG (A) supporting a successful company deployment for training to the Joint Readiness Training Center. After serving as the XO for four months, Maj. Byers was assigned as the Detachment Commander of SFOD-A 0224 in October of 2014. During his tenure as the Detachment Commander, he led the detachment on an austere deployment to Chad. He then led the detachment through a rigorous Pre-Mission Training cycle in preparation for deployment to Afghanistan. SFOD-A 0224 deployed to Afghanistan in June 2016 where Byers trained, advised, and assisted the Afghan Ktah Khas (KKA) unit. The KKA are a strategic level Afghan unit focused on targeting Taliban leadership, and Maj. Byers conducted 7 Afghan-led, 13 enabled, and 5 partnered operations with the KKA before being killed in action on 03 November 2016 in Kunduz Province. Maj. Byers’ military education includes: Modern Army Combatives – Level 1 Certification, Infantry Basic Officers Leader Course, Airborne School, Ranger School, Maneuver Captains Career Course, Survival Evasion Resistance and Escape School, Special Forces Qualification Course, Detachment Leaders Course, Military Freefall School, and Static Line Jumpmaster Course. Maj. Byers’ awards and decorations include: Purple Heart, Bronze Star Medal, Army Commendation Medal with two Oak Leaf Clusters, Army Achievement Medal, National Defense Service Medal, Afghanistan Campaign Medal with one Campaign Star, Iraq Campaign Medal with one Campaign Star, Global War on Terrorism Service Medal, Army Service Ribbon, Overseas Service Ribbon, NATO medal, Special Forces Tab, Ranger Tab, Combat Infantryman Badge, Expert Infantryman Badge, Military Free-Fall Parachutist Badge, Parachutist Badge. Maj. Byers is survived by his wife and both of his parents.